My mother’s luck continued as it always had. Now we were waiting inside Grand Central station, waiting for our sponsors to arrive, whoever they were. We waited, and then we waited some more, but no one showed up for us. As we stood there in the great hall of Grand Central station in the middle of rush hour, my mother was six months pregnant, had $30 in her pocket, had me to take care of, had nowhere to go, didn’t know anyone, and couldn’t speak English. We must have waited several hours. Eventually, something had to be done, and my resourceful mother did it. She spotted a Chasid, easily recognizable by his full beard, black coat, white shirt, dangling “tsitsis” (the little strings worn externally by Orthodox Jews) and black homburg, and decided to speak to him to see if he could or would help. In those days, nearly all Jews spoke Yiddish, the ancestral language of East European or Ashkenazi Jews, and so she stopped him and explained to him in Yiddish the nature of her problem. Obviously, he was on his way elsewhere, but immediately changed his mind. He led us to the Lexington Avenue subway, injected three dimes into the turnstile, we changed trains once, from express to local, and wound up on Astor Place, from where he walked us to the headquarters of HIAS, the Hebrew Immigrants Aid Society, located then on Lafayette Street in what had been the Astor Library and later became Joe Papp’s Public Theater. He deposited us in an office, introduced us to its personnel, wished us good luck, and left. HIAS in those days was a busy place. There were still “DP’s” or “Displaced Persons,” people whose homes and lives had been destroyed by the war, arriving in America almost every day, many needing food and shelter immediately. We were not “DP’s”, but we did need shelter and food, and we had arrived at exactly the right place. 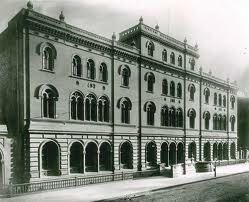 HIAS had established dormitories, men and women in separate ones, and a common kitchen and dining room. So, I slept in the men’s dormitory, and my mother slept in the women’s, and we met for breakfast in the common dining room. 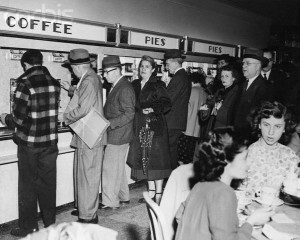 Occasionally we ate at the Horn & Hardart Automat, nearly across the street from HIAS. 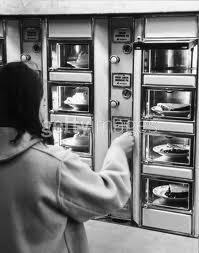 The Automat was part of a chain of restaurants in which you obtained your food by depositing nickels and dimes in coin slots above or to the side of little windows through which you could see the food you were purchasing. After you had deposited the correct change, the little window would open, and you could remove your selection. 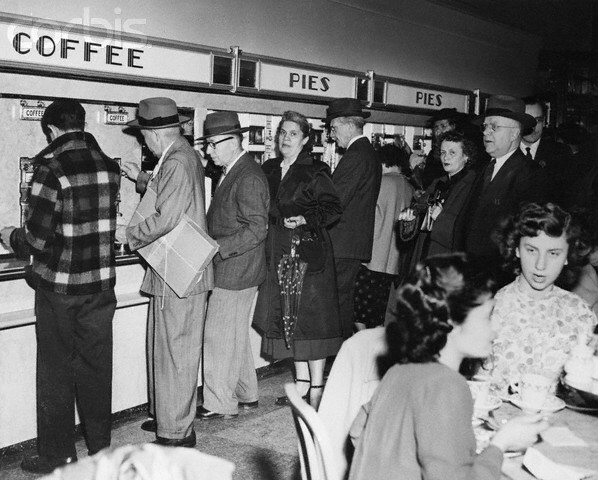 It was delicious food, very high tech service, in an upscale art deco setting, yet within a few years all the Automats would disappear, although in those days they were a feature of the cityscape. I have no idea how long we stayed at the HIAS headquarters. It was probably a couple of weeks, possibly a bit longer. One day, some distant relatives did show up at HIAS looking for us. I knew one of them, Hannah, because she had been Poldi’s sister and had left for Belgium for America a couple of years earlier. I didn’t know the man accompanying her, but he was Ruby, and I came to know him well. He was extremely thoughtful and kind, and bought me my first pair of long pants. In any case, they knew why there had been no one to meet us at Grand Central train terminal. Alex did you get the vegetable plate? My Moms favorite at the automat and so thats what my sister and I had to eat also. We did like it and probably had a dessert also. I’m giving away my age, just one year older than you. So glad you are writing these stories they are very important.. Wish I could remember what it was I ate over sixty years ago, but alas 🙁 At the Automat, I do remember that I liked the coffee and the lemon-meringue pie, which was brand new to me. Had never even heard of lemon-meringue! Automats/Horn & Hardarts (?) were a big part of my Saturdays shopping with Grandma Leah-fond memories, though no one seems to believe me now when I recall the memories…I don’t remember what I ate there either. Probably pies, although I’m sure grandma made me eat something else too. Thanks for sharing, as always! Next time I see you you’ll have to tell me about those good memories. This one made me cry. Not sure why. The kindness of the man taking you to HIAS, or the fact that your relatives did not show up at Grand Central and you wound up staying for days at HIAS. And it is about to get worse!